Joint Admission Counselling Delhi 2018 (जेएसी दिल्ली): The candidates who have cleared the JEE Main cutoff as decided by the JAC Delhi rules and scored minimum 60% marks in 10+2 standard are invited to register themselves by submitting the JAC Delhi Application Form 2018 on or before the last date. The online application submission for Joint Academic Counselling Delhi will be started from the next day of JEE Mains Result declaration and the result will declare in April. JAC Delhi offers admissions to the applicants for the BE, B.Tech and B.Arch and JAC Delhi 2018 conducts the common counselling process for the admissions. This counselling is done for the undergraduate applicant who wishes to apply for the various engineering programs offered by the university. The seats will be allotted on the basis of JEE Mains scorecard and their academic performance till 10+2 standard. The students who are seeking admissions in IIIT, Delhi. They have to submit the JAC Application Form 2018. The aspirants have to submit the form before the deadline. The students can apply for the online form on the official website. or they can click on the link provided here. We will provide here the direct link through which you can apply for the JAC Online Registration Form. The students have to follow some precise procedure for the submission of the online form. Candidate will get the application form Online as well as Offline. Steps to fill JAC Delhi 2018 Application Process are given below. Firstly applicant to register them self successfully. After the login, the applicant has to fill all the required details like name, DOB etc. The fees for the application form will be paid in the favour of JAC Delhi. If candidates have paid their fees then they will be allowed to fill their desired preferences. The Joint Admission Counselling Committee, Delhi has conducted the counselling to allocated the seat to the undergraduate applicant to get admissions in B.Tech engineering programs. The selection of the applicant is based upon the Scorecard of JEE Main 2018. Before applying for the counselling, the applicant must have to meet the eligibility criteria for the process. Admission to the participating Universities / Institution will be based on the All India Rank Prepared by CBSE giving 40% weightage to class XII marks and 60% to the performance in Paper – 1 of JEE (Main) 2018 Examination. For admission to B. Arch., Paper-2 of JEE (Main) 2018 Examination will Be considered. For IIIT-D, there are bonus marks. 85% seats will be reserved for the Delhi resident and there will be a reservation for the categories too. Aspirants have to score 80% marks in the best 5 subjects including PCM before applying for IIT Delhi. 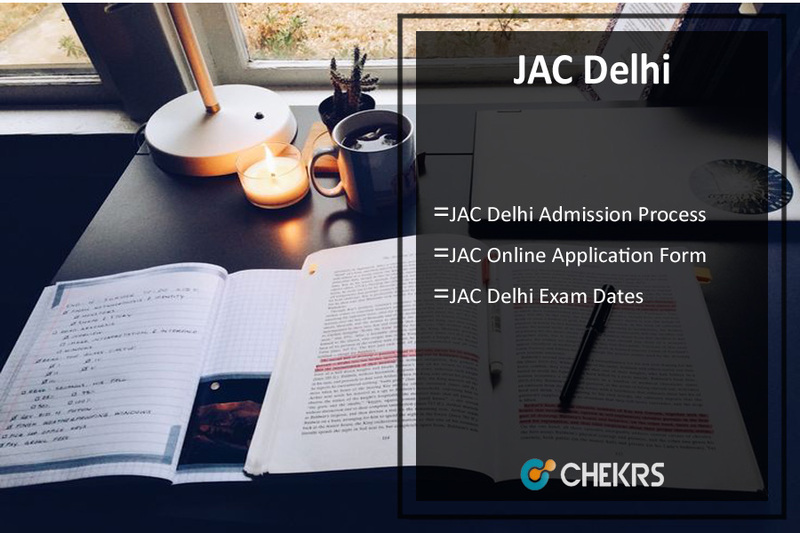 The applicant will get here the important dates of the JAC Delhi 2018 which are as follows. The dates are not confirmed, we will update the dates after the official notification announcement. The list of Colleges which undergoes the joint admission counselling process. Register for the JAC Delhi 2018 and have to submit their personal information and a scanned copy of photograph and signature in the registration form before submission. Login with the JAC registered id for the editing purpose. In the third step, candidates have to fill their choices for the colleges as per their eligibility criteria. Lock the choices selected by the aspirants. Candidates will be called for seat allotment process. The results will be declared for the aspirants who got selected for the seat allotment. Aspirants have to submit their fees for the admission process and the last and final step is to report in the institute where the seat is allotted to the aspirant. Candidates need to report in the institute where the seat is allotted to the aspirant. University will allocate the seat to the Applicant during the counselling process with the help of merit list which will be declared in the third week of July. On the day of counselling, aspirants have to carry their documents and admission fee for the JAC Delhi 2018 seat allotment. If the aspirants get allotted then they have to pay the admission fee on the day of counselling. JAC Delhi offers seats to the eligible applicant for the BE, B.Tech and B.Arch in various engineering programmes for the current academic year in Technical Universities / Institutes of Delhi state some of the universities are Delhi Technological University (DTU), Indira Gandhi Delhi Technical University for Women (IGDTUW), Indraprastha Institute of Information Technology Delhi (IIIT-D) and Netaji Subhas Institute of Technology (NSIT). This examination is a State level exam and 85% seats are reserved for the applicants of Delhi. Applicants can check the eligibility criteria for JAC Delhi 2018 counselling process in the given article. For feedback and more queries regarding the Joint Admission Counselling Delhi 2018, aspirants can contact us by commenting in the comment section given below.